It began with the shipwreck of the ferry taking them to join their newly purchased boat on Malta, and ended with them finding an authoritative Ancient Greek historian wrong about the Bosphorus passage. Two ordinary second-year students at Somerville College Oxford and their assorted crews sailed more than 1,500 miles in an open boat over four summers. Joining them at different junctures was a medley of fellow-sailors. To pick up crew at pre-arranged rendezvous at fortnightly intervals in the 1950s was a juggling act that for one crew member took three nights, eight trains and a ferry. But they only mislaid one – and in the search came close to losing the skipper. 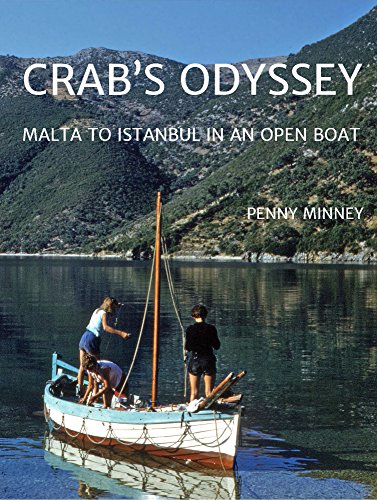 Penny Minney was born in London in 1934, moved to Laugharne in South Wales when she was three months old, and lived in a spacious tent that had seen better days as the property of the Sultan of Morocco, while the house was being repaired. This probably accounts for her lifelong addiction to the open air. She went to a traditional girls' boarding school, then Oxford.